Guy Martin on the Honda Racing Fireblade at the Cookstown 100 in 2017. Guy Martin is a late withdrawal from this weekend’s KDM Hire Cookstown 100. The Lincolnshire man was due to compete in the Classic race on his BSA Rocket at the Orritor course but has been forced to pull out of the first Irish national road race of the season. It is understood Martin recently returned from Russia, where he has been working on his latest project. The 36-year-old says he has run into gearbox problems with his home-built BSA, which cannot be resolved in time for the County Tyrone meeting. Martin returned to Cookstown last year for the first time since 2015. The 11-time Ulster Grand Prix winner has a fine record at the event, but Martin struggled on his comeback on the Honda Racing Fireblade and Wilson Craig 600 last year. 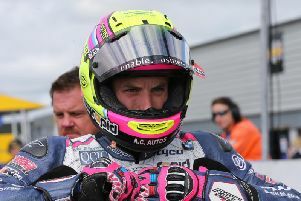 His travails continued at the North West 200 and culminated in a high-speed crash at Doran’s Bend in the Superbike race at the Isle of Man TT. Fortunately, he escaped unscathed but Honda Racing later withdrew from the Senior race and Martin’s stint in the team came to an end weeks afterwards. There was some confusion over his future plans - including reports he had retired from the sport - but Martin said he still intended to remain involved, albeit on a lesser scale. Fans could still see Martin in action soon in Northern Ireland as he is entered on the BSA for next month’s Tandragee 100. Practice for the Cookstown 100 will be held from 12 noon on Friday.